Do you know someone that attended residential school? If you or someone you know were placed in the residential school system, you should know that there are resources to help through the difficulty times you or your loved one experiencied. Also provided is background information to help you understand residential school experiences. Keep reading to learn more about these schools and how counselling helps. 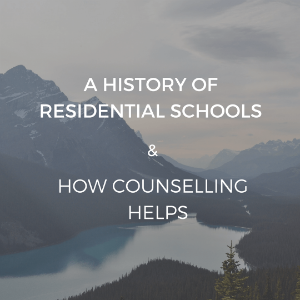 What is a Residential School and Why Were They Initiated? Residential schools started in the late 1800s and the last school finally closed in 1996. These schools were funded by the government and run by churches, to eliminate parental involvement in the upbringing of Aboriginal children. Residential schools peaked in the 1930s, intended for Aboriginal kids to adopt Christianity and learn “Canadian customs.” Eventually, these children would procreate, passing along newly learned traditions to their children, diminishing all native traditions. Attendance to Residential Schools was mandated and agents were employed to ensure all native children were attending. The kids were forcibly removed from their homes and families and punished when caught speaking their native language. Mistreatment of these children could range anywhere from sexual abuse to physical abuse to emotional abuse to starvation and so much more. 24% of students, who were previously healthy, died while in a residential school, mostly due to malnourishment and abuse. Most students were in school and away from their families for at least 10 months a year, if not longer. Siblings of different genders didn’t see each other because activities were divided by gender. Additionally, children were taught to be ashamed of their heritage and as a result, often had difficulty returning to their families. Children were mainly taught practical skills in these schools; girls were taught domestic skills and spent most of their days doing laundry, cleaning and cooking. The boys were taught carpentry and agricultural skills. At 18 years of age, students were forced to leave school and discouraged from furthering their education. Many committed suicide or turned to drinking once they finished school. Counselling for attendees of Residential Schools (or second generation survivors) can help with emotional healing from this experience. Revisiting painful memories can be a part of the recovery process and it’s important to recognize the reactions and feelings you have repressed. Emotional responses are perfectly normal and should be expected. Healing is possible. It will take time. There are different types of counselling available. Speak with an Elder, an Aboriginal community worker or a professional counsellor. Please contact me with any questions or feel free to schedule an appointment with me. If you prefer, you can call me at (250) 830-3285.